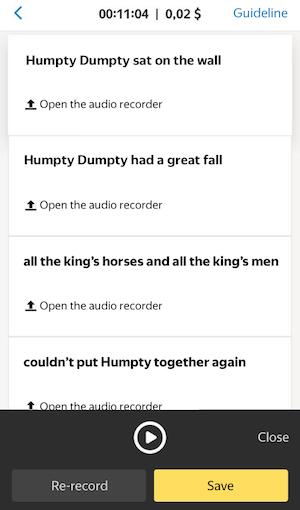 Voice recording tasks are most convenient to run in a mobile application for Android and iOS. Mobile apps let you record audio directly in a task using your device's built-in voice recorder. Let's say you need to collect audio recordings in which users voice your text. 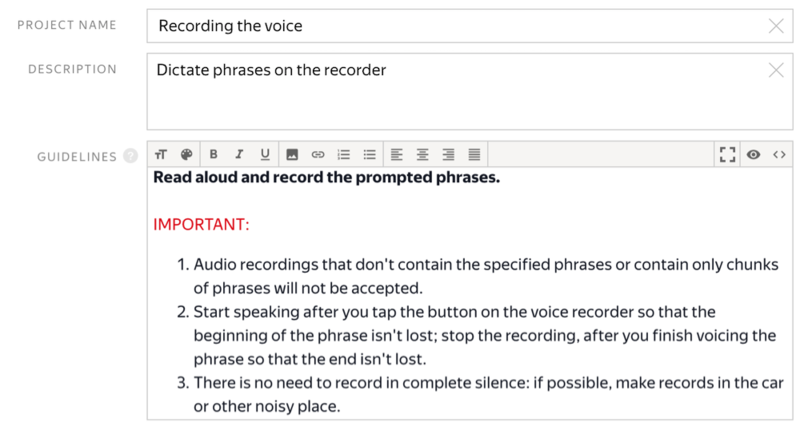 To do this, create a task in which the performer is offered a text phrase and should attach an audio recording as a response. A project describes the task design for a performer. Click the + Create project button and choose the empty template at the bottom of the page. Enter a clear name and a short description for the project. Performers will see them in the task list. Write short and comprehensive guidelines (see the recommendations). Define which objects you are going to pass to the performers and receive from them in response. To do this, add input and output fields in the Specifications block. What are input and output data? Input data are types of objects that are passed to the performer for completing the task. For example, this could be a text, an image, or geographic coordinates. Output data are types of objects that you receive after the task is completed. For example, this could be one of several response options, typed text, or an uploaded file. More on input and output data fields. Input data field — The phrase string with the text to be voiced by the performer. Output data field — The audio_record file, an audio recording that the performer should upload. Create the task interface in the HTML and CSS blocks. It describes how the task elements should be arranged in the task. You can use standard HTML tags and special expressions in double curly brackets for input and output data fields. Text from the phrase input field. Button to start the audio recorder and record a file saved in the audio_record field. Click the Preview button to view the task. Lower the screen resolution using the browser tools to make sure that the task looks correctly on mobile devices. Note. The preview shows four tasks with standard data. You can define the number of tasks to show on the page later. A pool is a set of paid tasks sent out for completion at the same time. Open the project and click Add Pool → Add Pool. Give any name and description to the pool. The pool info is only available to you. Performers can view only the project name and description. Set the price per task page (for instance, $0.02). What is a task page? A page can contain one or several tasks. If the tasks are simple, you can add 10-20 tasks per page. Don't make pages too long, as it slows down the performer's download speed. Performers get paid for completing the whole page. The number of tasks on the page is set when uploading tasks. What is the fair price for a task page? The general rule of pricing is the more time the performer spends to complete the task, the higher the price is. You can register in Toloka as a performer and find out how much other requesters pay for tasks. Set the Time allowed for completing a task page. It should be enough to read the guidelines and wait for task data to download. For example, 1200 seconds. Set an Overlap, which is the number of performers to complete the same task. The value depends on how many recordings of the same phrase you want to collect. If one is enough, put 1. If there is no adult content in the task in any form, turn off Adult content. Enable the Offline accept option and enter the number of days for checking in the Deadline field. For example, 7. Add Filters to choose performers. Download the File example for task uploading (tsv) in the pool. A TSV file presents a table as a text file in which columns are separated by tabs. You can work with it both in a table editor and a text editor, and then save it to the desired format. More about working with a TSV file. Note. Before uploading the file, make sure it is saved in UTF-8 encoding. Add input data in it. The header of the input data column contains the word INPUT. Put the text for voicing in the INPUT:phrase column and remove other columns. Load of the tasks: choose Set manually and set, for example, 5 tasks per page. This means that there are 5 phrases per page and the performer has to attach 5 audio files. Start the pool by clicking . Track the completion in the Pool statistics block. Start the review as soon as you get the first results. After the specified time period, all responses are automatically accepted, regardless of their quality. To check the tasks and download the attached files, open the pool and click Download results, and then Download attachments. Note. The files received from the Toloka app are in the WAV 16KHz 16bit PCM format.